# HP 51645ABlack print cartridge that provides 600 x 600-dpi printing, excellent media independence and greater throughput because of its 1/2-inch print swath. 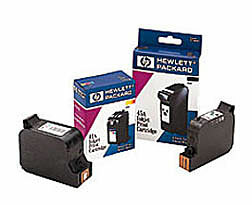 # Color cartridges provide spot or fluorescent color. # Pigment-based ink delivers professional-quality, rich results. # Tri-color print cartridge that provides high resolution through the use of C-REt II. # Prints with a small drop size to produce even color and smooth color reproduction. # For use in DeskJet 710C, 712C, 720C, 722C, 890C, 895C, and 1120C.